1. Preheat the oven to 200˚C, gas mark 6. Simmer the artichokes in boiling water for 15 minutes. Drain, then steam dry for a minute. 2. 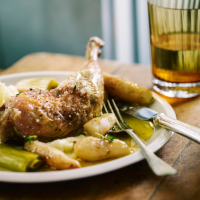 Put the artichokes in a roasting tin with the chicken legs, leeks, thyme and garlic. Season and add 2 tbsp olive oil. Add the wine, lemon juice and squeezed lemon halves. Toss, then spread in one layer, with the chicken skin-side up and the artichokes cut-side down. Drizzle 1 tbsp oil over the chicken. 3. Roast for 40 minutes, turning the veg (but not the chicken) halfway, until the chicken is thoroughly cooked with no pink meat. Scrape any brown bits from the bottom of the pan; roast for 5 more minutes, then serve. This recipe was first published in Sat Nov 01 15:25:14 GMT 2014.